This unique WRAPZ is a favorite among baseball pitchers, gymnasts and swimmers. The Shoulder WRAPZ covers a large 20" x 16" area, allows for adjustability and works for either shoulder. This one size fits all product comes with two WRAPZPAK and is a best seller. 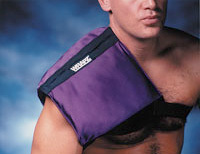 The multi-use product also works for upper back and thigh injuries.